It’s a necessity AND a statement piece. Thinking of placing ceiling fans into your home? Let us tell you why that's a great idea. Ceiling fans reduce energy costs while providing excellent airflow, style and beautiful lighting in your humble abode. A ceiling fan with lights is versatile, as you can gain both function and style. Take a couple of minutes to scroll down, and go through 10 of these best ceiling fans. This Faber ceiling fan is perfect for those who dislike having too many sockets or regulators on their walls. Equipped with a remote control, now you don’t have to get up and adjust the speed while watching Netflix. Switching the speed and, controlling the mode and function is just a click away. Large rooms require proper ventilation and bright lights, and you can get the best of both worlds with Elmark. This ceiling fan comes with super bright LED lights and a 3-speed fan with five microfibre blades. If you have a big room, install a few of this ceiling fans, and you don't need extra lights anymore. A good sleep depends on the sleeping environment. That being said, Panasonic designed this ceiling fan that'll produce maximum breeze and minimum noise of <54 (dB). Consider getting this an if you are a light sleeper because everyone deserves good sleep. The reason why we love lights attached to our ceiling fans is so that we can enjoy the 2-in-1 function. Milux offers just what everybody wants: a 5-blade ABS aerodynamic blades with a powerful motor. Also, it uses E27 light bulbs that only need 85W of power. Talk about energy-saving. This KDK fan has a canopy cover which is 292mm in length; it stays closer to the ceiling. It's ideal for homes with low ceilings and is designed with four blades to give you strong air breeze. Additionally, it comes with a classic colour to better suit your interior design. Bonus point: this fan has 'Sleep Mode' too. You can always trust KDK when it comes to ceiling fans. KDK 3-blade is a regulator type fan with 5-speed. It's equipped with wider sweeping blades and an energy-saving condenser motor. Plus, this ceiling fan is enhanced with a cut-off safety device and a blade safety plate. 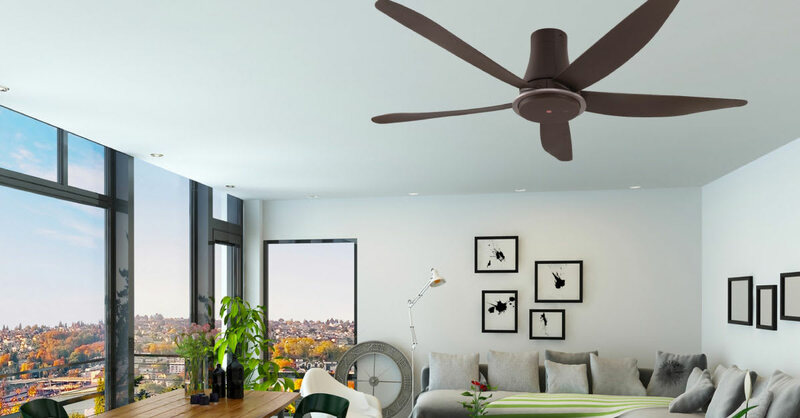 The DEKA KRONOS ceiling fan is designed to give you 20% extra of air-flow. With four A.B.S Polymer blades that offer silent and quiet breeze, what’s not to love? Also, it comes with a three-year warranty for the motor. Elmark UFO38 is 42 inches in size and has eight acrylic blades. Its décor light uses E27 bulbs and comes with a remote control. This ceiling fan is beautifully designed to suit any interior with a contemporary design. Cool while decorating your living room with this stunning and sophisticated looking fan. It feels good dining over warm lights and a cool breeze. Think candlelight dinner without the fear of candles dying out. This fan comes with a three-speed remote control with timer. You can also control the three-tone LED lights - choose from warm white, cool white or cool daylight. This 100% copper MAVA MV1 comes with a regulator and a high-performance motor. It’s suitable for high ceilings if a longer downrod is added to the fan. The metal blades are specially designed to provide you with great airflow throughout your house.